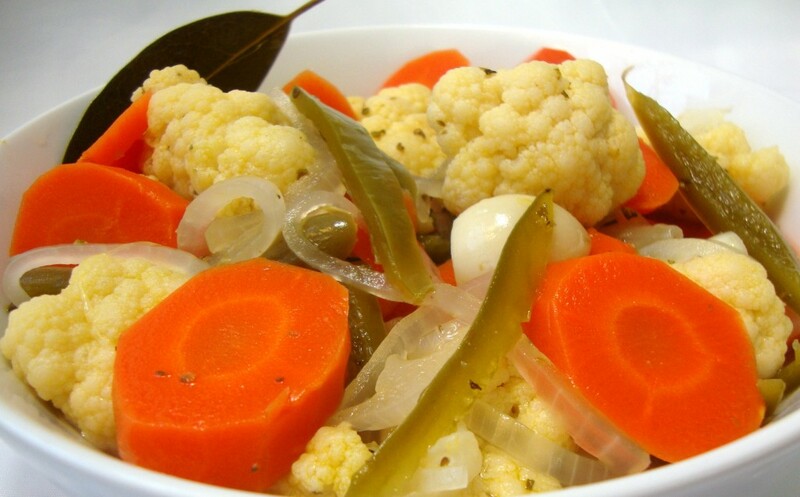 “Escabeche” is the Spanish word for “pickle”. This simple but zesty combination of crunchy pickled vegetables is a favorite for serving with Mexican cuisine. Add the olive oil to a large cooking pot and place over medium-low heat. Add the vegetables and salt and sweat the mixture for about 10 minutes until softened. Keep the heat on the low side to avoid browning the vegetables. Add the water, vinegar, sugar and herbs and bring to a rapid boil. Cover the pot and remove from the heat to cool. When cooled, divide the mixture between 2 one-quart jars (be sure to include a bay leaf into each jar), seal and refrigerate for a minimum of 3 days before serving (the longer the better). The refrigerated escabeche will last for a few months stored in this manner. To seal the jars and preserve the escabeche for pantry storage, removing the pot from the heat. Carefully divide the hot mixture between 2 one-quart mason jars (be sure to include a bay leaf in each jar). Put the lids in place and tighten the lid rings. Invert the jars for 10 minutes. After 10 minutes, upright the jars and slightly loosen the lid rings. Let the jars rest and cool until the lids “pop” and seal shut. Retighten the lid rings and store the jars in your pantry until ready to use. Although many people consider tomatoes to be a vegetable, they’re actually a fruit; so why not make them into jam? 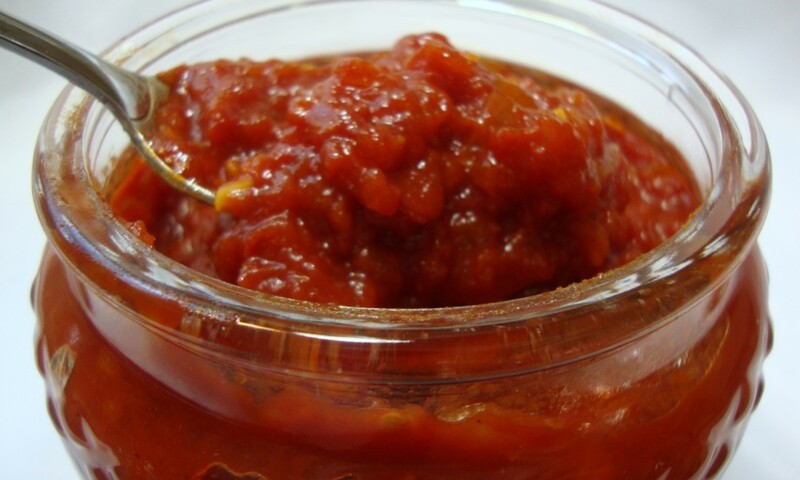 Actually, tomato jam is more like a relish than a true jam. My partner Chef Mike and I created this blend one Sunday afternoon and we were thrilled with the lovely balance of sweet, tangy and smoky flavors. This jam is wonderful when used as an alternative to ketchup on veggie burgers and hot dogs. It’s also excellent when served with cheese, such as non-dairy chèvre, on crostini or crusty bread. This recipe yields about 2 cups. Drain the excess liquid from the can of tomatoes and place the tomatoes into a food processor; do not process yet. If using fresh tomatoes, bring a large volume of water to a boil. Core the tomatoes and place them into the boiling water for 1 minute. Immediately plunge them into an ice water bath. Once cooled, the skins should slip off easily. Place the tomatoes into the food processor; do not process yet. In a medium saucepan, sweat the onion and garlic in the olive oil over medium-low heat, stirring occasionally. The goal is to soften and draw out the flavor of the onion and garlic without browning. When the onion becomes translucent, transfer the mixture to the food processor with the tomatoes and pulse a few times into a “salsa-like” consistency. Transfer the tomato mixture back to the saucepan and stir in the remaining ingredients. Bring the mixture to a boil, reduce the heat to a gentle simmer and cook uncovered for 1 hour and 15 minutes, stirring occasionally. Let the jam cool and transfer to a sealable container. Refrigerate until well-chilled before serving. Keep in mind that this is a fresh jam, not a preserved jam, but the acidity and sugar will keep it fresh in the refrigerator for a few weeks. Heavy cashew cream and puréed fruit form the base for this delightful frozen treat. 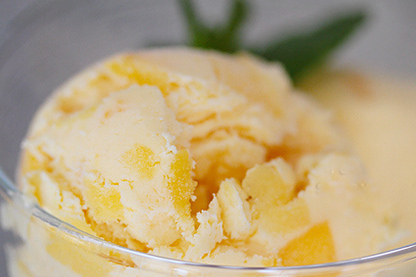 An ice cream maker is required for this recipe. Place the cashews and milk into a container with a lid, seal and place in the refrigerator to soak for a minimum of 8 hours. After soaking, place the ingredients in a high-powered blender and process on high speed for 2 full minutes. The cream will now need to be strained to remove the solids. To do this, wash your hands thoroughly and pour the cream into the nut milk bag over a large bowl or pitcher. While holding the top of the bag with one hand, gently knead the bag to help the cream pass through the ultra-fine mesh – avoid forcing the cream through. Discard or compost the solids in the bag. Optionally, the cream can be poured (in increments) into a strainer lined with 4 layers of cheesecloth. Stir the cream gently with a spoon to help it pass through the cheesecloth. Pour the heavy cream into a blender and add the sugar and guar gum; process until smooth. Pour the mixture into a container and refrigerate until very cold (or place in the freezer for about 30 minutes). When well chilled, pour the cream mixture into your ice cream maker and add the chilled fruit purée. Process the mixture according to your ice cream maker’s instructions. Ceviche (pronounced “seh-VEE-chay”) is a Latin American dish which traditionally consists of raw fish or shellfish marinated in citrus juice (usually lime and/or lemon juice). The acid in the citrus juice coagulates (denatures) the proteins in the seafood, effectively cooking it. Since no heat is used, the dish is served cold. There are many recipe variations combining the marinated fish/shellfish with a wide variety of other fresh ingredients such as onion, tomato, cilantro, chili peppers and avocado. My plant-based version relies upon cooked unripe green jackfruit as a replacement for the fish/shellfish, since it has a neutral flavor which takes on the flavor of the marinade and a flaky texture reminiscent of cooked crab. The dish is essentially a zesty, marinated plant-based salad which is served cold as a refreshing appetizer with crispy corn tortilla chips. This recipe yields enough ceviche for 2 to 3 guests; for more simply multiply the recipe. 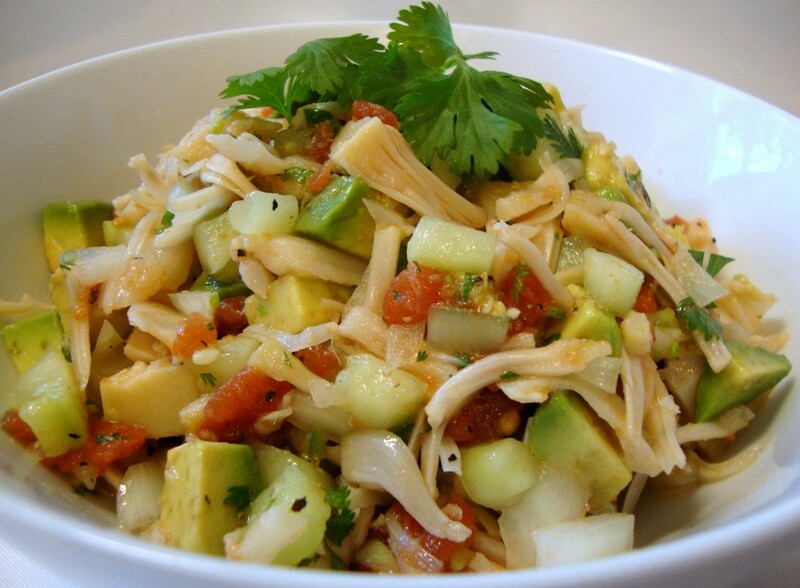 *Canned green jackfruit bears a resemblance to flaked crabmeat when cooked. It can be found in Indian and Asian markets or purchased through the internet. Look for the label “Green Jackfruit” or “Young Green Jackfruit” and be sure that it’s packed in water or brine and not syrup. Cans of ripe jackfruit packed in syrup may be stocked nearby, but don’t be tempted to substitute as the ripe fruit will be too sweet for this application. Chef’s note: Traditional ceviche made with fresh seafood has a fresh, clean flavor and should not be fishy. If you wish to add a subtle ocean flavor to this plant-based version, add a little bit of dried kelp flakes or flaked, toasted nori. Drain the jackfruit and rinse. If the jackfruit was canned in brine, rinse thoroughly. Add the chunks of jackfruit to 1 quart salted boiling water. Reduce the heat to a slow boil and cook for 15 minutes. Drain in a colander and let cool. When cool enough to handle, remove the tough core from each chunk of jackfruit with a sharp knife and discard. Break the chunks apart with your fingers and remove the soft seeds and seed membranes and discard. The remaining flaky pulp is the only portion you will want to use in the dish, so sort through the chunks carefully (there will be a significant amount of unusable material). Wrap the pulp in a lint-free kitchen towel and squeeze to remove excess water. Coarsely chop the pulp and place in a mixing bowl. Add the remaining ingredients EXCEPT for the avocado and toss well to combine. Refrigerate for several hours to marinate the ingredients and blend the flavors. Add the diced avocado just before serving and toss well. Season the ceviche with additional salt as desired and to taste. Serve with crunchy tortilla chips. This fresh chunky garden salsa has a medium heat which can be adjusted to suit your taste. I chose canned whole tomatoes because they are partially stewed during the canning process, thus producing a superb texture for salsa. It’s very easy to make and so much better than store-bought. This recipe yields about 4 cups. Remove the tomatoes from the can and finely dice, reserving any juice in the can for other uses, if desired. The tomatoes themselves contain a great deal of juice, so use a cutting board with irrigation channels if you have one; if not, dice 1 or 2 tomatoes at a time. 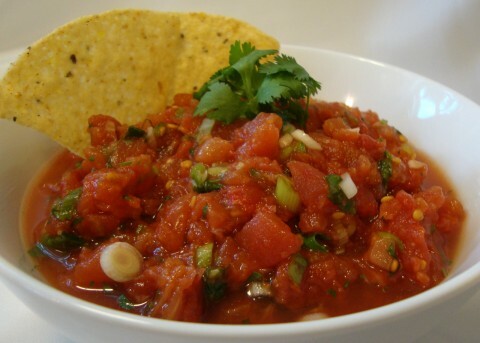 Place the diced tomatoes in a mixing bowl and toss together with the remaining ingredients. Refrigerate for several hours to blend the flavors, ideally overnight. Taste and add additional salt before serving, as desired. The salsa will keep for about 10 days in the refrigerator. Serve with your favorite tortilla chips; or use as a topping for your favorite Mexican or Tex-Mex recipes. 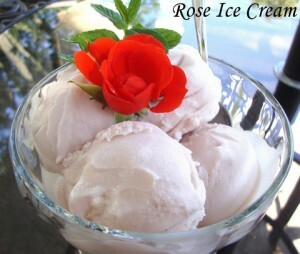 The heavenly floral fragrance and flavor of roses is perfectly captured in this rather unusual frozen confection. In Persian cuisine, this ice cream treat, called “Bastani”, also contains saffron and toasted chopped pistachios. However, I’ve kept the recipe simple and affordable, as saffron is very expensive; but the option is provided if you choose to be traditional. I’ve also added beet powder to produce the lovely pastel rose color, but this is purely optional and should be omitted when preparing Bastani. An ice cream maker is required for this recipe. A word of caution! Floral flavors in food are exotic and unfamiliar to most Westerners. I recommend adding ½ tsp of rosewater to 4 oz. of non-dairy milk and tasting it to see if you find it agreeable before making an entire quart of ice cream. When blending the mixture for the ice cream, begin with 1 tablespoon of rosewater, taste it and then add more to your liking. Soak the cashews in water for a minimum of 8 hours. Drain and discard the water and add the cashews to a high-powered blender. Add the filtered water and process on high speed for 2 full minutes. Thoroughly strain the cream through a nut milk bag or through a strainer lined with 4 layers of cheesecloth. Gently massage the bag to help the cream pass through or stir the cream in the strainer with a spoon. Add the cashew cream back to the blender with the remaining ingredients, EXCEPT for the optional pistachios, and process briefly until combined. Transfer the mixture to a saucepan and cook over medium heat, stirring constantly until the mixture thickens and is heated through. Do not boil. Note: If you’re making traditional Persian Bastani, add the saffron threads while the mixture is cooking. After cooking, pass the mixture through a strainer to remove the threads and proceed with the recipe as usual. Remove from the heat and let cool until warm (stir the mixture occasionally to discourage a “skin” from forming on the surface). Once cooled, pour the mixture into a container with a lid and refrigerate until thoroughly chilled. When well chilled, pour the cream mixture into your ice cream maker and process the mixture according to your ice cream maker’s instructions. If using pistachios, add the pistachios at this time (or simply top the prepared ice cream with them). The ice cream will freeze hard when stored in the freezer. To serve, thaw briefly until it reaches the desired texture for scooping.